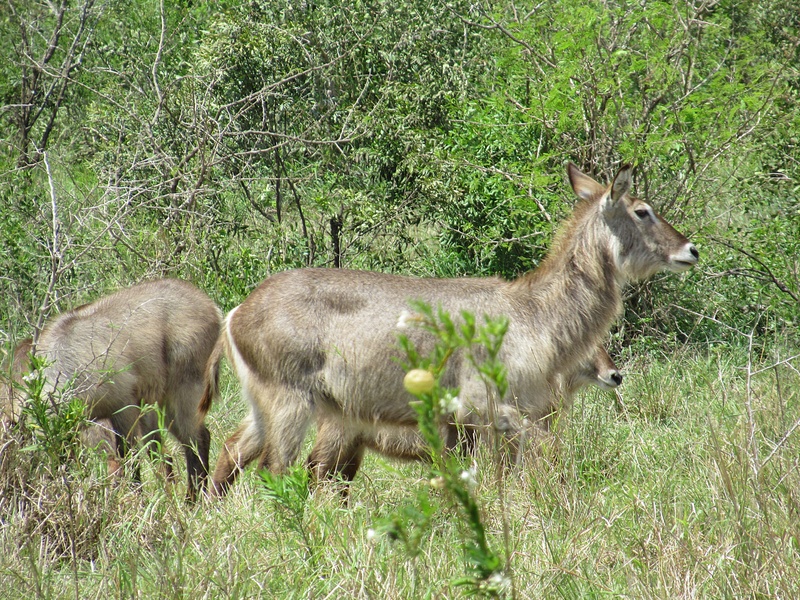 This week, I shared a game drive in Hluhluwe Imfolozi Game Reserve with a couple from Oakland. 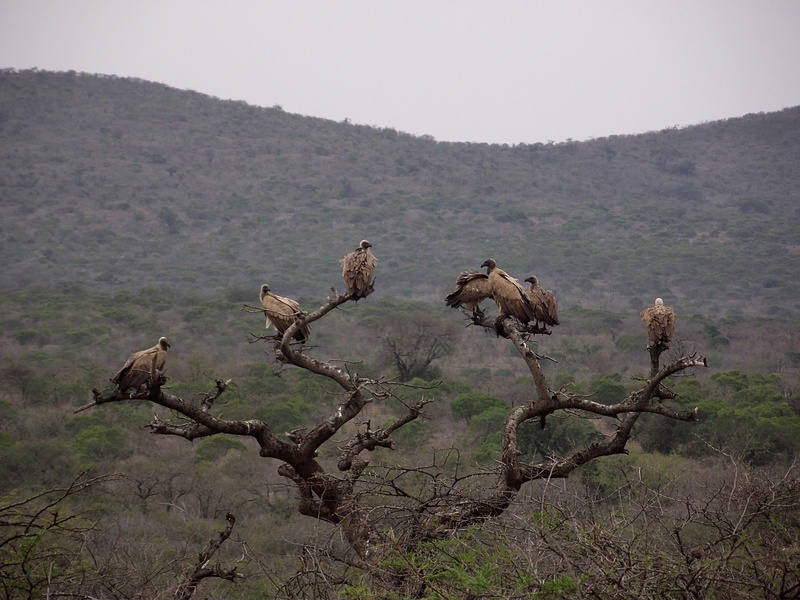 It was their first visit to South Africa and first game drive. We were in awe of the animals and happy to be in a covered safari vehicle. It was a cool, windy day, and tourists we saw huddled in open trucks were shivering. 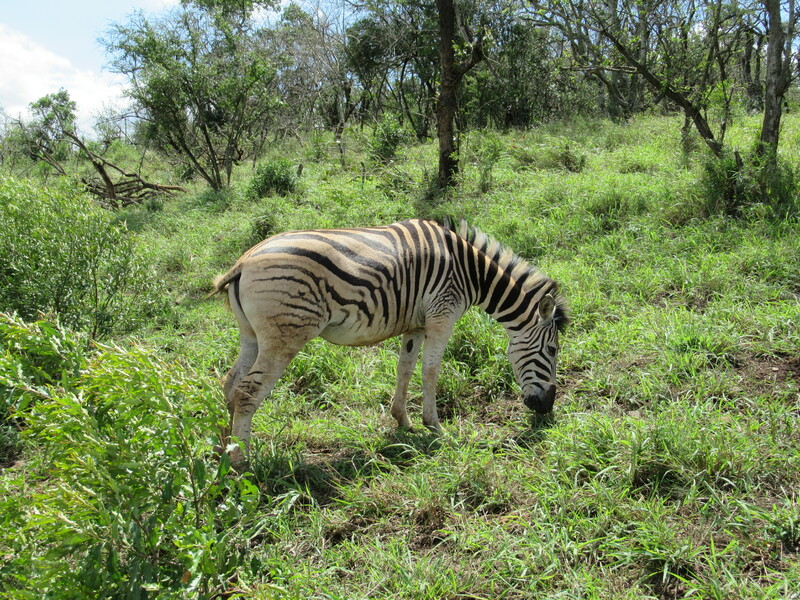 Hluhluwe is a beautiful reserve about 3 hours north of Durban in Zululand, KwaZulu Natal. The landscape is stunning, and its forests, thickets, woodlands, and rivers are a haven for birds and game. 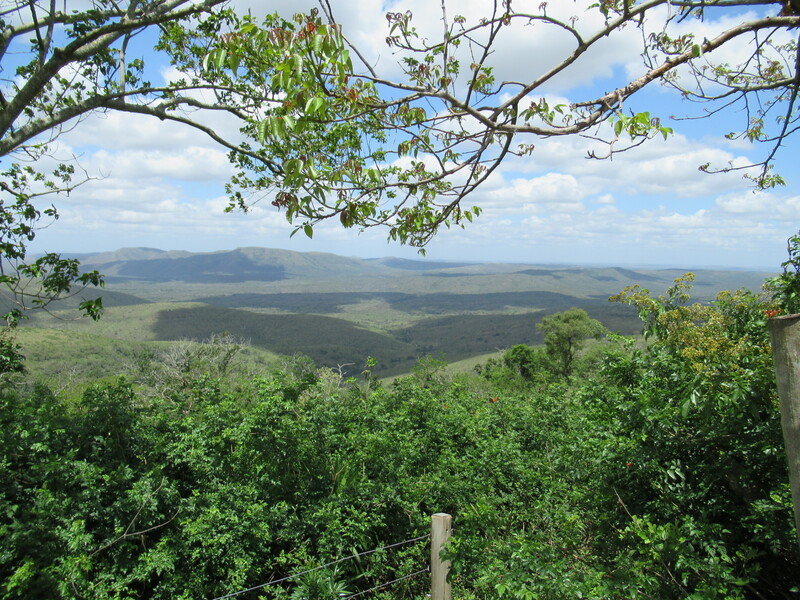 Timber, sugar-cane, and pineapples are grown in the area. 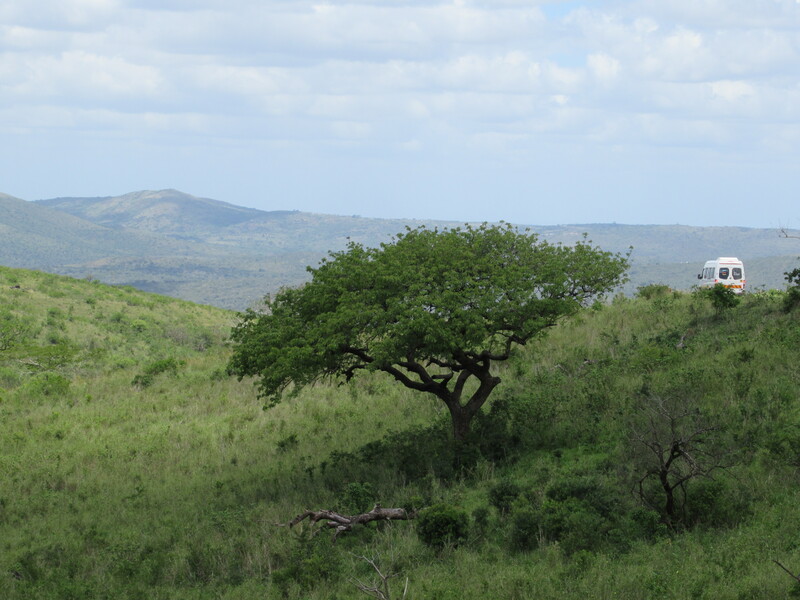 In 1895, British colonists declared Hluhluwe (pronounced SLOO SLOO WE in Zulu) a protected wildlife sanctuary. 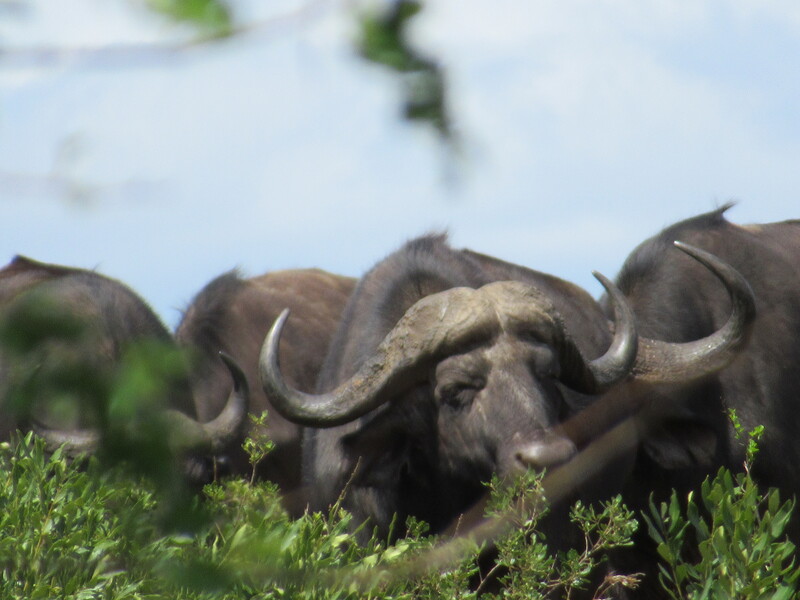 The reserve covers 370 square miles and includes the big five – elephant, leopard, lion, rhinoceros, and buffalo. The “Big Five are considered the most dangerous animals to hunt on foot”. 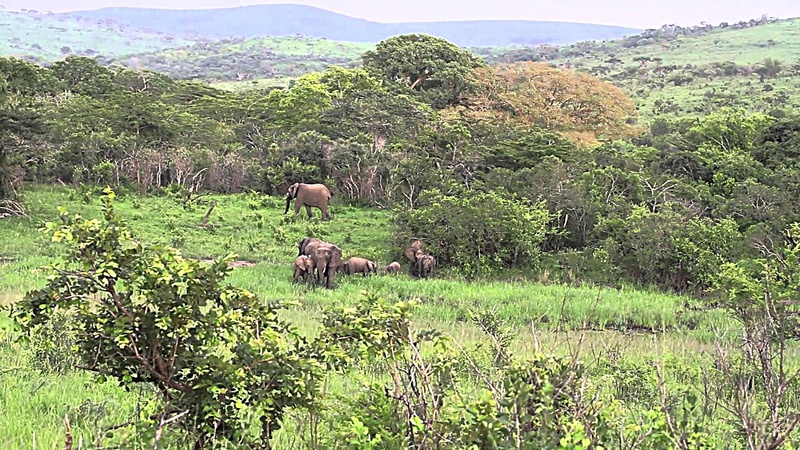 Hluhluwe once was the “exclusive hunting domain of Zulu kings, including legendary King Shaka“. We saw small game, large antelope, zebra, buffalo, elephant, and an elusive rhinoceros, but no wild dog, leopard, hyena, hippo, cheetah, or lion. 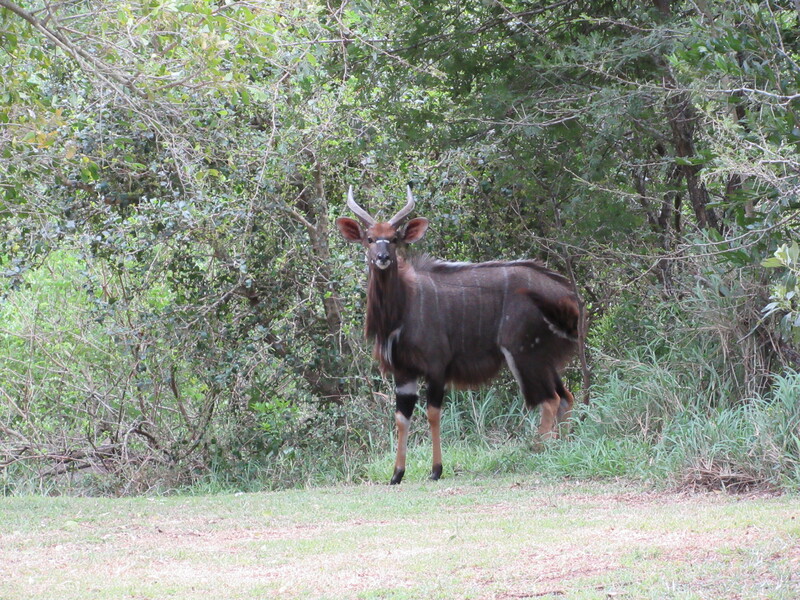 It was the first time I’ve seen Nyala – a gorgeous animal native to South Africa! Game drives are always hit or miss, and I was happy to see smaller animals that were evasive during a two-month safari last year. 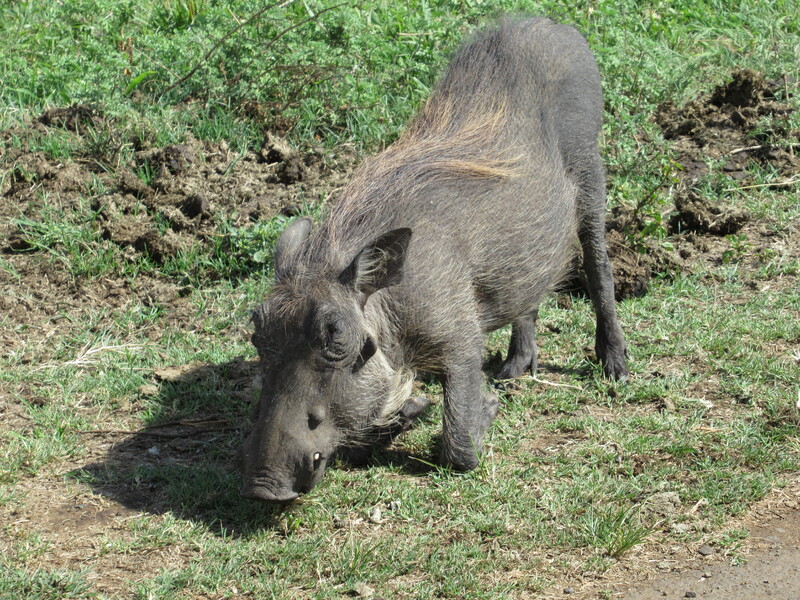 Warthogs in Hluhluwe were abundant and came close to our vehicle. From my experiences in East Africa, as soon as they saw a safari vehicle, they ran away in a tizz with their little tails held high in the air. Shockingly, rhino and elephant are always under siege by relentless poachers. Poaching is a serious crime and a continuing problem. Poachers are severely punished and rangers patrol parks and reserves 24/7. After 7 pm, only vehicles with special permits can drive inside the reserve. After that hour, rangers have the right to shoot (without question) humans in the park. During the day, visitors are allowed out of their vehicles at certain points only – this rule is strictly followed for the safety and well-being of humans and game. I’m learning a new Canon digital camera and took only a few photos during the drive. Still missing the broken Sony… It was a memorable, educational day at Hluhluwe – good company and time well spent! 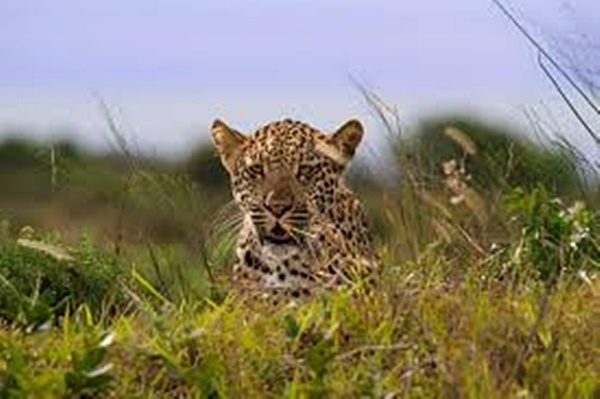 This entry was posted in Africa, Durban, South Africa and tagged Big Five, Black Rhino, Hluhluwe Imfolozi Game Reserve, King Shaka, Natal Parks Board, Northern KwaZulu Natal, Nyala, Rhino Poachers, White Rhino, Zululand by suemtravels. Bookmark the permalink.